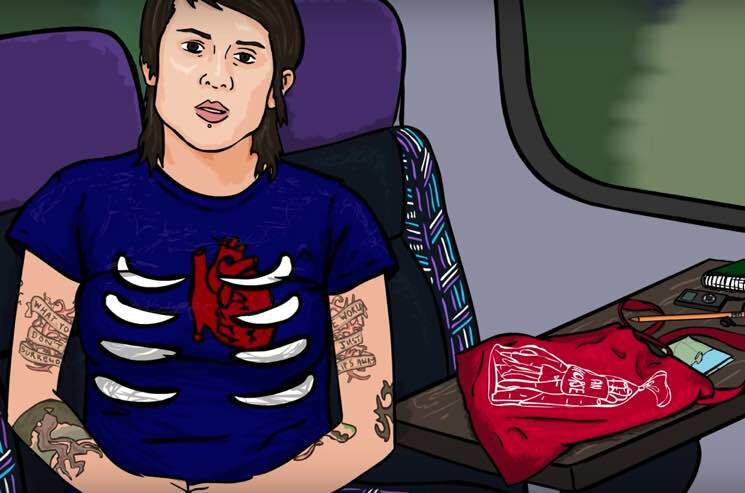 Tegan and Sara recently toasted the 10th anniversary of The Con with a covers compilation, and now the duo has unveiled a new video for City and Colour's contribution to The Con X: Covers. The accompanying clip for "Hop a Plane" was initially made by director/animator Kristine Thune around the initial album release 10 years ago, but she's recut the visuals for an offering that proves just as poignant a decade later. Tegan and Sara initially met City and Colour's Dallas Green when he opened for them on a run of dates in support of The Con, so the recent collaboration seemed a natural fit. "I knew Dallas would be able to take the song and make it into something completely different," Tegan Quin tells tells Exclaim! "Over the years, I had wondered if the song could have been something different, had I changed the pop/punk aesthetic of the actual recording. It didn't entirely fit the rest of the record and so I was curious to see how Dallas would reinvent it. I LOVE the version he recorded. I think it captures the longing and regret that the song holds in it. The upbeat nature of the original recording glossed over some of the desperation in the lyrics, and I think Dallas restored its original charm from my demo." Hear Green's rendition of "Hop a Plane" set to Thune's animated video down below.